The baby (and dog) gate turned out well. The flat pieces were all 1/2″ ash. Pivots are 3/8″ dowels. These may need to be sanded or the holes reamed a bit due to the variation in the dowel diameters. Make sure to round off the ends to make assembly easy. The spindles were all pre-finished prior to glue-up . This is very important. 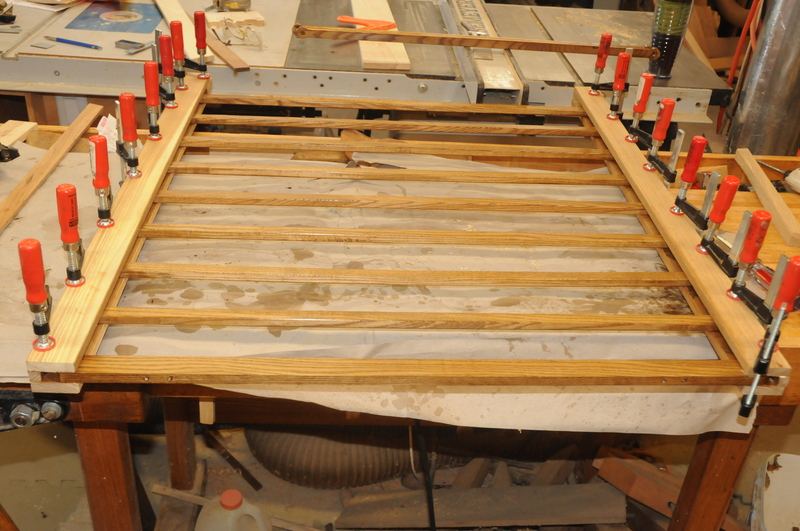 You cannot get good coverage once assembled but more importantly, if you have any glue squeeze out form the dowels you could end up with a frozen / inoperable gate. Stain is Minwax Provincial which is what we used when we built the house. As well as 2 coats of garnet shellac to moderately match the aging and provide a modest degree of protection. The 2 coats of garnet shellac help the color match tremendously but the old wood is still more yellow. Oak and Ash yellow considerably in the first 2-10 years of sunlight exposure. So new pieces stained the same and placed next to old ones will look sickly pale in comparison. The shellac makes up most of the difference. 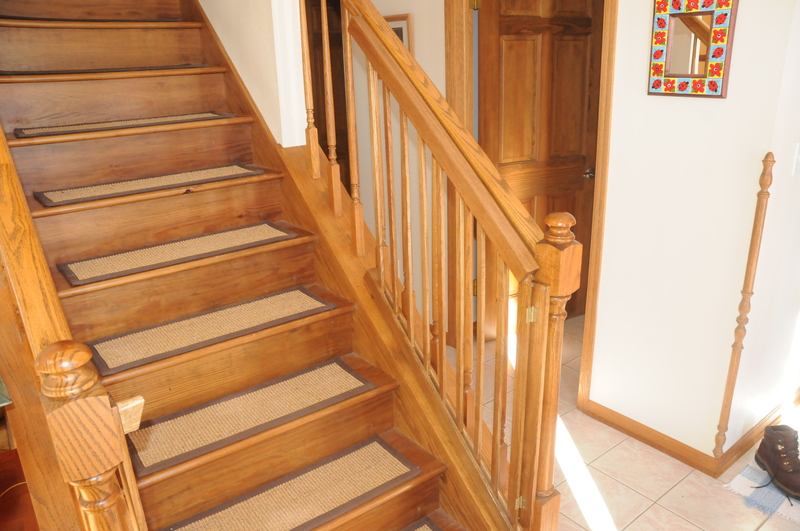 Don’t go for an exact match as the wood will darken, you just don’t want it to be seen as initially being completely out of place. 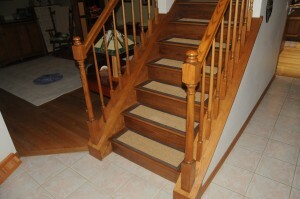 The gate pieces were fastened on to the stairs with # 6x 1.5″ screws. So when it is removed years from now the holes will be small and easy to fill and match. 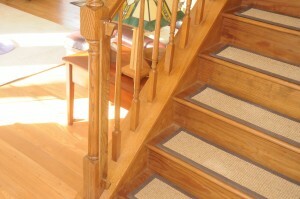 The left side rests on a couple of rests that are fastened to the stair baluster . They are unobtrusive when open and almost completely hidden when closed off. When parked to the side the gate rests on a small block that raises it up parallel to the hand rail and holds it open. We expect that cats, kids, and dogs will try to shut it on the unsuspecting and this will likely foil their evil plans. Overall, it is a successful project. Teal is happy and as a reward today is Meatball Day ( she gets Swedish and I get Italian). I am waiting for the replacement stepper motor controller for the CNC router. Some of the parts for the over-voltage / counter -EMF protection have started to show up. That will be for another post. 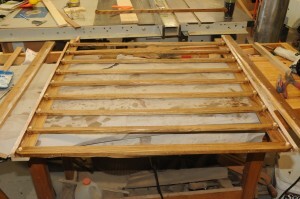 This past weekend we started on a new project: building a baby / dog gate for the bottom of the stairs. When the kids come over they often bring their dogs which we don’t want upstairs and at some point our grand son, Sawyer will be wandering about and stairs are not an desirable early adventure. So we need to make a gate at the bottom of the stairs . However the end of the stair is exposed and wider than there is clearance on either side. So an ordinary swinging gate wont cut it. 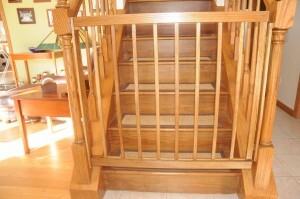 After searching for a bit we came across a post at: http://woodgears.ca/home/baby_gate.html that was close to what I had in mind!. SO here was the jumping off point for the new design. Stain to match existing wood work as this is likely to be in place for 10 years or so. 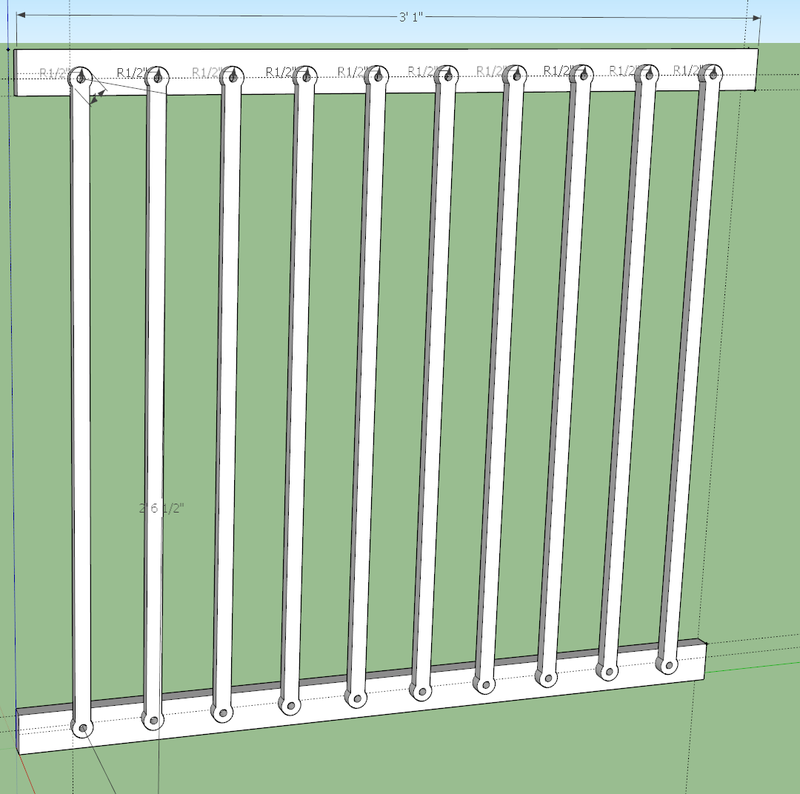 Initial rough design was done in Sketchup, to slim out the spindles I went with “lollipop ends”. 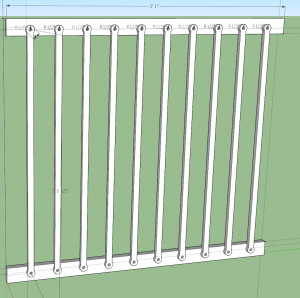 They would be a pain to do manually but a perfect excuse for the CNC router.to make them . Stock is 1/2″ thick ash. This was to use up some planks I had that were a bit on the thin side and save weight compared to oak. The spindle drawing was exported from Sketchup and imported into Vcarve Pro. Auto tab placement in this case is useless. You need to place the tabs yourself to make them line up with each other rather than air. Add more tabs than you think you will need. Sometimes the wood will spring as it is cut due to internal stresses. You don’t want to have the pieces ruined due to the tabs breaking due to stress. So the with the first piece I got 3 spindles cut before the board warped and broke apart (hence the lots of tabs requirement). Plus I was seeing more chatter / roughness than I would like with 4 tabs per piece . Second plank was done with 6 tabs per piece. Much better cut quality and it held together. Here is a sample of the CNC router cutting the spindles – sped up after the first cuts. I then moved the gantry to the far end to clear off the parts and place the blank for the new one. On removing the pieces, I see the waste board has the outline of part of the last spindle — oh oh – router bit slipping in the collet – I must tighten more next time. I then reset the bit, put in the new blank and then go to move the gantry and – nothing. System is in emergency stop and on further investigation I find one of the stepper drivers for the Y axis is malfunctioning. Bummer. I had hoped to run a bunch of parts over the weekend and the stepper drivers are 1 week short of the 1 year warranty limit. Even with the failure I had almost enough spindles cut to make the gate. 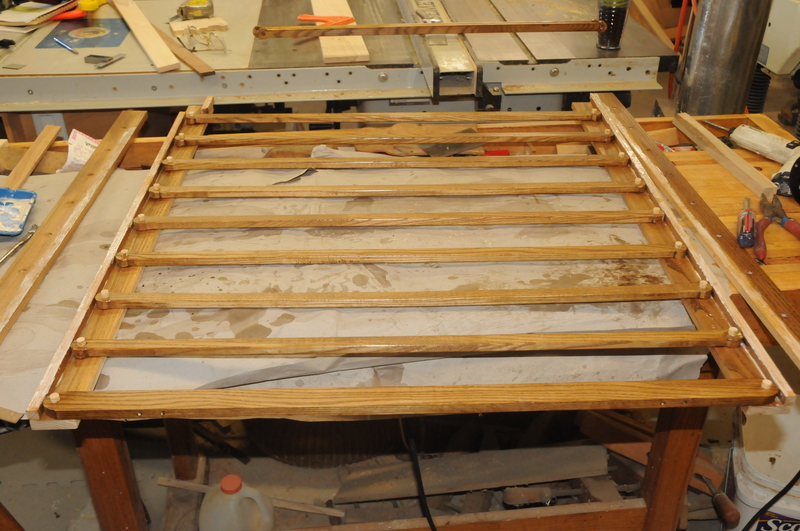 One had to be cut by hand on the bandsaw and then cleaned up with hand plane, scraper and sander –what a pain. So we had the parts ready for staining and assembly the first day although with the CNC failure my mood was not great. 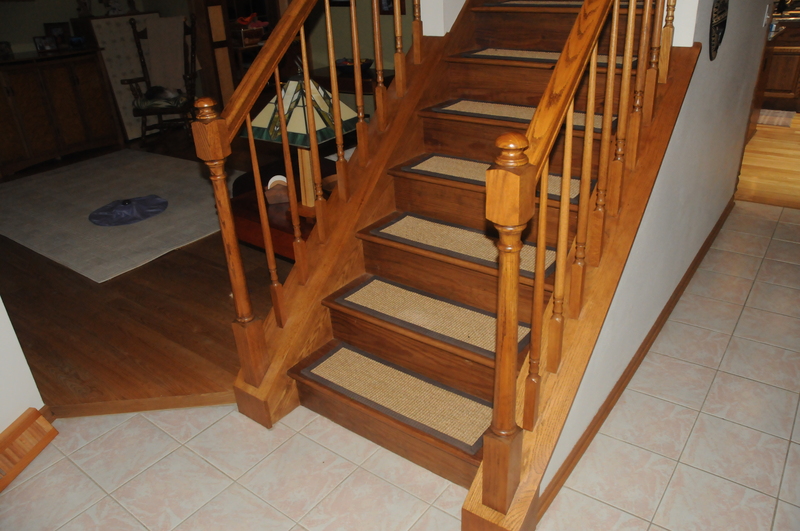 We pre-stained the parts and added 2 coats of garnet shellac to better match the yellowing of the 20 year old wood. Assembly went rather well. The shot above shows the spindles with the lollipop ends. 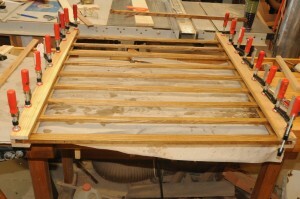 This photo shows the gate with the cover side glued on.